Pluckley village is said to be the most haunted village in the UK, and was even named as such in the Guinness book of world records in 1989. Even though it hasn't been named as such since, it certainly hasn't lost its reputation and remains one of the most well known hot spots for paranormal activity in the UK. When the first buildings were placed here is unknown, as smaller settlements simply didn't bother to keep records, but it was mentioned in the Domesday which was completed in 1086. It was thought be quite a significant settlement for the area but was later taken over by the near by larger town of Ashford. 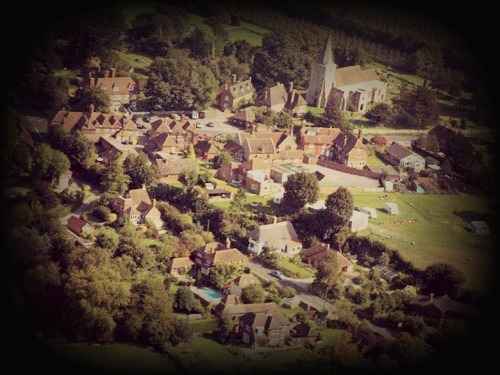 The village has been featured in the media a number of times, including visits from TV shows "strange but true", "ghost hunters international", and "most haunted: midsummer murders", not to mention being featured on top gear. There are some very old buildings in the village and a rich history for the area, so the best way to get to know the village would be to pay it a visit, and many of the locals love telling visitors about the spooky place in which they live. There are thought to be between 12 and 16 different ghost here and all though its no where near the highest number of spirits for one area, their frequent activity seems to have more than earned the village its ghostly reputation. There is very frequent paranormal activity here and you never have to go far until you reach the next haunted spot, but some ghosts have come to be more well known than others. In the area which is now known as Fright Corner, the ghost of the highway man resides. His apparition has been seen here dressed in peasant clothing and carrying a sword. The story goes that he was a typical highway man who robbed a number of travelers and was responsible for several deaths, but one day he tried to rob the wrong person. In what was supposed to be a normal stick-up, his victim fought back and in the following fight managed to pin the robber to a tree with his own sword. Since then he as been seen on the corner with reports of him even appearing right in front of people with his hand on his sword as if ready to draw before fading away into nothing. Another well known ghost here is that of a school master who, for unknown reasons, took his own life by hanging himself in the school, only to be found by his own pupils. His apparition has been seen at the old school grounds wearing his favorite coat and stripy trousers and he is thought to be responsible for footsteps and doors slamming in the building when no one is inside. There are a huge amount of reports of other ghosts and their antics, such as a random scream coming from the outside of a few buildings in town, thought to be from the spirit of a builder who fell from the roof of a building he was working on and died on impact. A ghostly white woman has been seen on the villages bridge, always holding a cigarette, thought to be the spirit of a women who died from a fire caused by her falling asleep while smoking. From poltergeist activity to orbs and unexplainable smells of burning yarn, this village really does have it all. Well known as being the most haunted village in the UK it has received the reputation and media credibility it deserves. There are a number of bed and breakfasts and hotels in the area and since its a village the whole thing is open to the public. There are frequent ghosts tours in the area by various groups and a number of guest houses play on the ghostly reputation of Pluckley village to entice guests to stay they. Highly recommended for any paranormal lover.